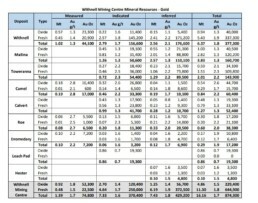 At the Withnell Mining Centre, increases are due to the delineation of new Mineral Resources at the Mallina, Toweranna and Leach Pad deposits as well as increases to the Camel and Roe deposits to incorporate successful exploration drilling results. 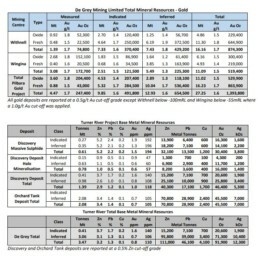 The total Withnell Mining Centre Mineral Resource inventory at September 2018 comprised 16.2Mt at 1.7g/t Au for 874koz, an increase of 62% in ounces compared to the June 2017 estimate. At the Wingina Mining Centre, material increases to the Mt Berghaus and Amanda Mineral Resource estimates resulted from the incorporation of successful exploration drilling results. 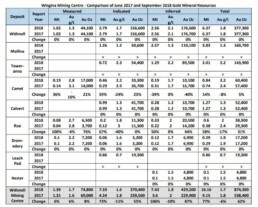 The Mineral Resource at September 2018 for the Wingina Mining Centre comprised 11.1Mt at 1.5g/t Au for 519koz, an increase of 12% in ounces compared to the estimate reported at June 2017. The Company’s procedures for the sample techniques and sample preparation are regularly reviewed and audited by independent experts. Assays are performed by independent internationally accredited laboratories with a QAQC program showing acceptable levels of accuracy and precision. The exploration assay results database is maintained and appropriate backed-up internally. All De Grey Mineral Resource estimates have been undertaken independently by Payne Geological Services Pty Ltd. The information i in this Annual Mineral Resources Statement is based on, and fairly represents information and supporting documentation prepared by Mr Paul Payne, a Competent Person who is a Fellow of the Australasian Institute of Mining and Metallurgy. Mr Payne is a full-time employee of Payne Geological Services. Mr Payne has sufficient experience that is relevant to the style of mineralisation and type of deposit under consideration and to the activity being undertaken to qualify as a Competent Person as defined in the 2012 Edition of the “Australasian Code for Reporting of Exploration Results, Mineral Resources and Ore Reserves”. Mr Payne consents to the inclusion in the report of the matters based on his information in the form and context in which it appears. Mr Payne has approved this Mineral Resources Statement as a whole and consents to its inclusion in the Annual Report in the form and context in which it appears. In relation to Mineral Resources, the Company confirms that all material assumptions and technical parameters that underpin the relevant market announcement continue to apply and have not materially changed.